In the original seasons of Twin Peaks and Fire Walk With Me, there were two states of reality in play: the material world and Lodgespace. 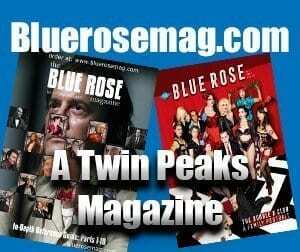 But as Season 3 proceeded, it became clear where once there were dualities there are now instinctively three available choices, as best explained by Brien Allen in Themes of Three in the Third Season of Twin Peaks. In this theory, I will explain how states of reality now follow this pattern of three. In Part 1, I explained how Season 3 is a state of reality situated between the Timeline (the material state of reality) and Lodgespace (the non-material state of reality), able to look out onto both of the other reality states. Here, we will look more closely at this new in-between state of reality as if it operated with all the properties of a mirror, and then at how this in-between state was likely formed in the first place (I blame Dale Cooper). In Season 2 we learn Norma cheats on Ed with Hank, and that sends Ed to marry Nadine almost right away. In SHoTP , we learn that Ed went to Vietnam and it was Hank actively intercepting Ed’s letters that caused Hank and Norma to marry first, with Ed marrying Nadine at a later point. In Season 1 we learn Bobby is cheating on Laura with Shelly Johnson. In Final Dossier we learn Bobby is cheating on Shelly with Laura. In Season 2, Ben Horne leaves his Civil War delusion by winning the war for the South. In SHoTP Jacoby guides him to let the North win the war to leave his delusion. In Episode 29, Ben Horne hits his head on the Haywards’ fireplace before the bank explosion. In Final Dossier, the bank explosion happens before Ben’s injury. Considered opposites in popular culture, Pete Martell plays chess in the Timeline and checkers in the in-between of SHoTP. 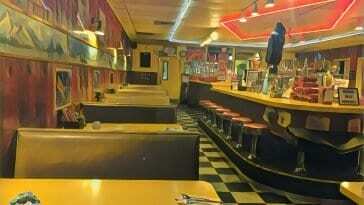 In the Access Guide to Twin Peaks, we learn that the Martells arrive first to Twin Peaks, followed by The Packards. In SHoTP, the Packards arrive first followed by the Martells. Also in the Access Guide, the Twin Peaks High football team (Steeplejacks) has a perfect season thanks to a final play featuring Hawk. In SHoTP the team (Lumberjacks) suffered a defeat in the championship game thanks to Hank Jennings throwing the game on purpose on the final play. In both of Frost’s books Margaret Lanterman’s last name is changed to Coulson. It is a tribute to Catherine Coulson, but it is also a reflection from the Log Lady’s role in the original series to her altered form in the in-between state (As we only hear Margaret contacting Hawk over a phone, I contest the Margaret Lanterman from Season 3 is calling in to the in-between from the Timeline). And let’s not forget about the Bookhouse library page in SHoTP. Aaron Mento described how only the I, 8 and II were the same exact image with its original or when reflected in the mirror, and the first words of those books said “Fear the Double.” If this isn’t literally making the case for what I’m trying to explain here, nothing is. In Fire Walk With Me, we get Phillip Jeffries saying “Who do you think this is there?” It’s more immediate, feels more like he’d refer to a person that way. 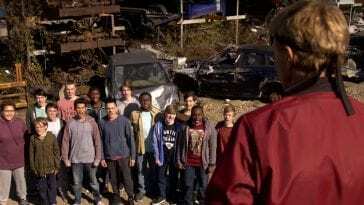 In Season 3, there’s alternate footage of the same scene, with the altered dialogue of “Who do you think that is there?” Seems more removed to say that, removing a little humanity as well, as I would think “that” would refer more to a thing than a person. Also, “this” implies something right next to me or even in my hand. “That” implies a bit of a distance. It’s a tonal feeling but it’s there. Either way though, it’s not a precise reproduction, and therefore seems more akin to a reflection rather than an original image. I also think things like backwards blinking are signs in Season 3 of seeing through to either Timeline or Lodgespace. I’m thinking specifically of Sonny Jim in the backseat, with Cooper nested inside Dougie Jones shedding a tear as to what he could’ve had if he was part of the Timeline. Therefore Sonny Jim, blinking backwards, is at that moment tuned to the Timeline. Backwards speech and even the 119 Mom are all reversal Lodgespace signs being observed from the In-between. Gordon Cole, likely while tuned to an Unofficial Version (Lodgespace), regularly says “apologies in advance for Albert” immediately after Albert says something offensive. The way a Woodsman kills Bill Hastings is remembered backwards by Diane as she and the agents and officers recount events they can only remember after they’ve begun drinking coffee. She says, about a described Woodsman, “I think I saw somebody like that getting out of the police car,” but earlier Diane is only clearly shown watching a Woodsman go IN to the police car. “Find Laura” can and probably does mean a number of things, but the root issue of Season 3 is choosing between that which is and is not. And I’ve already said Laura’s Timestream “is” and Carrie’s Lodgespace “is not.” As Leland went into the Light in Episode 16 of the Timeline-tied Season 2, Leland is probably making an appearance from another state much, as the Fireman appears in the Waiting Room in Episode 29. Leland is possibly warning Dale to tune to the Timeline rather than the Lodgespace that is throwing everything out of balance. The first time Leland is in the Waiting Room telling this to Dale Cooper, Dale is in an in-between state and he’s mostly tuned towards the Timeline, therefore he comes from one side of the screen. The second time Leland is in the Waiting Room, Dale is coming from a time when he’s already “saved” Laura from her death and is therefore tuned to the Lodgespace “dream” where Laura did not die (Phillip Gerard saying the “Fire Walk With Me” poem in normal speech rather than backwards-speak could also be evidence that Dale has been tuned closer to Lodgespace). 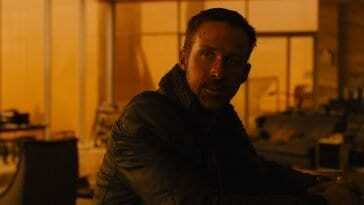 He comes from the opposite side of the screen in an exact reversal of the film from the previous scene. And later Dale finds Carrie. Moments that stutter (primarily the Part 8 stuttering Woodsmen scenes, the Part 17 clock in the sheriff station, and Frank and the Deputies superimposing in Part 14) seem to be oscillating quickly between Timeline tuning and Lodgespace tuning due to their proximity to portals. The closer you are to a portal, the closer you are to a doorway between those two dimensions and I suspect you’ll be able to see all your options most clearly then; as if all your tuning is present at once like an orchestra rather than a solo instrument. How do all these characters and locations exist in this in-between state? 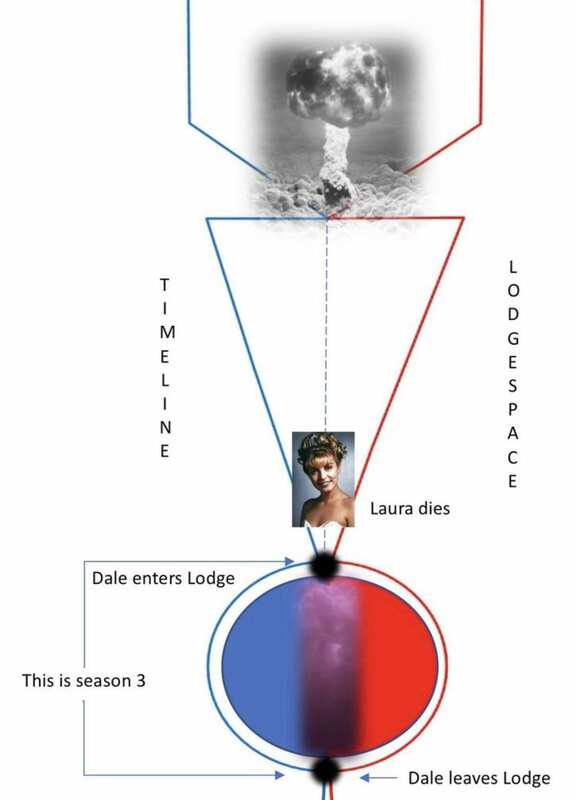 As Dale Cooper created the Lodgespace “dream” that is flowing at the Timeline like a river, I believe he is also the cause of the third state of reality in the first place. If this was Dale’s internal process of finding himself, reassembling himself in a Jungian way that I believe Frost intends, then why are all these other characters caught up in it? 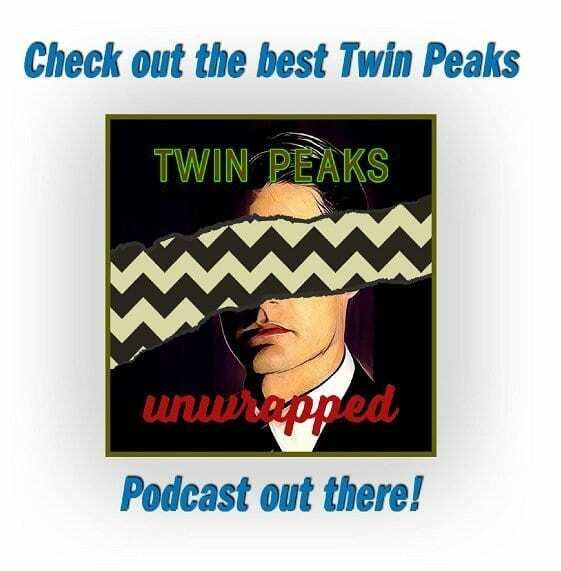 Because Dale Cooper tied reality and everyone into it when he entered the Waiting Room in Episode 29 and switched places with his doppelganger. DoppelCooper is made of pure non-material and Dale is made of pure material, so there is now a tether to the Timeline within Lodgespace and there is a tether to Lodgespace firmly embedded in the Timeline. The polarities have flipped, and Dale (as he exhibits in Parts 17 and 18) is acting like he’s as powerful as (and probably has become) a magician. 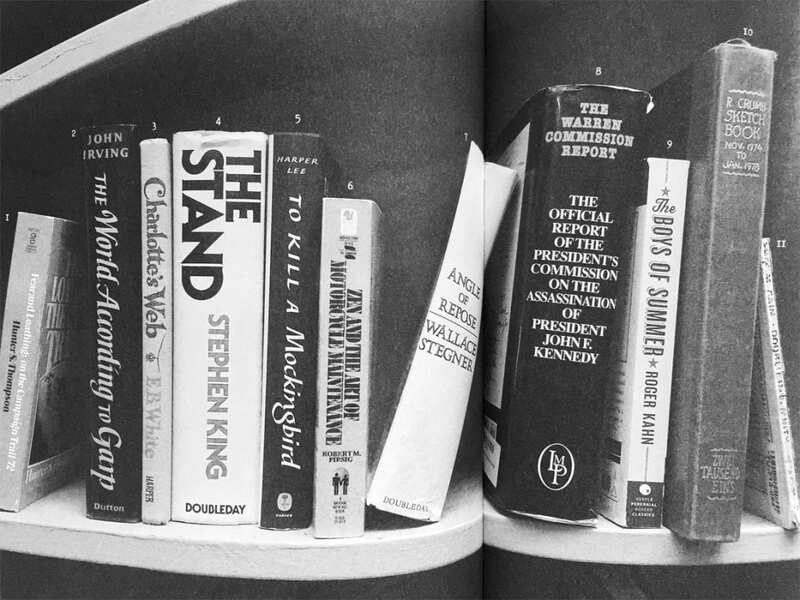 Therefore, much as Lynch’s dreamer concept, Dale’s formed a state of lucid dream, where, as Mike Wilson from the Drink Full and Descend Podcast defined it, things appear to be exactly half in the waking world and half in the dream. Because Dale is the one who’s reversed polarities, this reality is shaped to his order. As a human being from the Timeline, Dale experiences his life in chronological order. 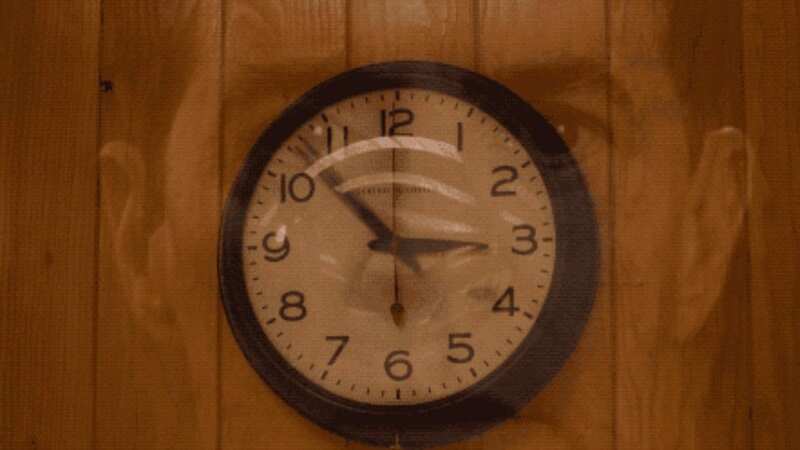 As he experiences it through time loops within the lodge, his experience also happens as if they were multiple times over the exact same period of time within the time stream. The evidence of “multiple timelines” comes from this. The evidence of what I’ve been calling Timequake since Secret History comes from this as well, except instead of two tectonic plates interacting and causing vibrational shockwaves through time, it appears that Dale Cooper is the specific nexus point of interaction and all the shockwaves go through and from him. Before I rationalize these “multiple timelines” happening concurrently with the real timeline, I will go through Dale’s time loops in chronological order from his point of view, as if it were all a straight line. Because this is how Dale experiences it. As told in a line, we can see how Dale, as a person dealing with trauma, is in a point between understanding and a decision. Another in-between state. Laura, in Part 1, literally says “You can go out now” but he chooses to wait around for an excuse why he couldn’t. It’s that BOB problem. He’s got to defeat BOB first and get the doppelganger back in. THEN he can leave. It reminds me of how Audrey couldn’t possibly go to the all-important Roadhouse even though her husband said he’d go with her, and she stops going just because he was sleepy. If Dale REALLY wanted to leave the Lodge, he could’ve gone when Laura said he could leave. Instead he chose to believe Gerard and the BOB excuse, because that suited his wants better. Dale does not go out when Laura/Carrie says he can “go out now,” because he is not ready. Instead he meanders his way into an in-between state as Dougie. I will explain later how Dale’s state of mind personifies his particular time loops, but first, let’s establish where they are. These are where loop points happen. I’ll get back to the Laura whispers as I think they point to a hopeful conclusion that is tuned more with the Timeline (as he first received the whisper while he was completely attached to the Timeline), but I think Dale had a choice to choose Love or Fear during Part 2. He could choose to believe Laura when she told him “you can go out now”, or he could follow the path as he tries to answer “Is it future or is it past.” How to put it more plainly? Dale has a choice: Leave the Lodge (as Laura suggests), or go further into the curtains (as Phillip motions him over that way). He chooses to go into the curtains; literally deeper into Lodgespace. 1st Loop: Timeline-adjacent, but the one that interrupts the natural timeline events (such as Hawk not meeting Dale as the Lodge curtains in Part 2). This is also where DoppelCooper makes the glass box and amasses his criminal empire and wealth while Dale is in the Waiting Room. 2nd Loop: This begins with Dale leaving through Non-Existence, then living as Dougie Jones, and ends in all the superhero stuff at the sheriff station. This is the only loop that specifically mentions Judy, Freddie, an unofficial version, or any plan between Briggs, Cooper and Cole. It’s also the only loop that includes Sarah Palmer as a possessed woman, Experiment, Experiment Model, or the Fireman and Dido sending a Laura orb into the world through their junction point. 3rd Loop: This is a dark world where very few people are. 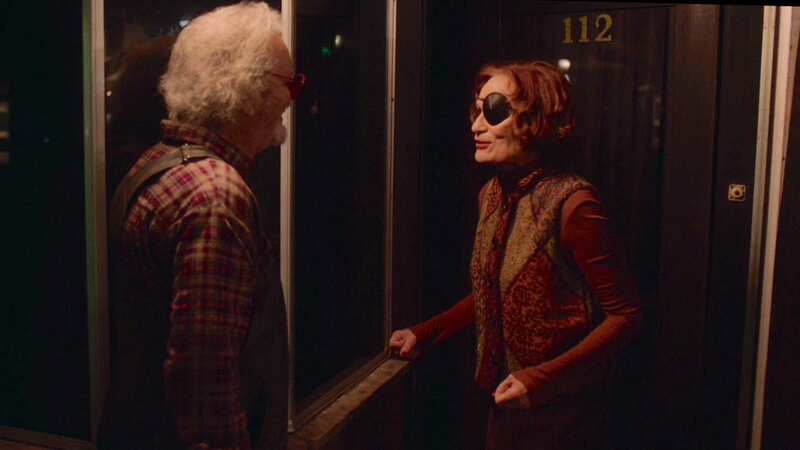 As far as I’m concerned, this is the dream Margaret warns Hawk about, and this is the one where Laura Palmer is Carrie Page and Diane somehow becomes Linda as she likely detaches from the dream midway through. This is Dale’s hubris run amok as he ignores the fact of genuine history. There is a 4th Loop that just begins as well. It could be a full reset because it begins with the whisper from Laura rather than “Is it future or is it past,” but we may never know because it begins in the final credits of Part 18 and is currently unfinished. More on the 4th loop later. The 2nd loop is the one in the middle, the POV location of Season 3. If you look (with the intention of positive energy) to the Timeline, you’re tuned to see events close to how they went in the 1st Loop. 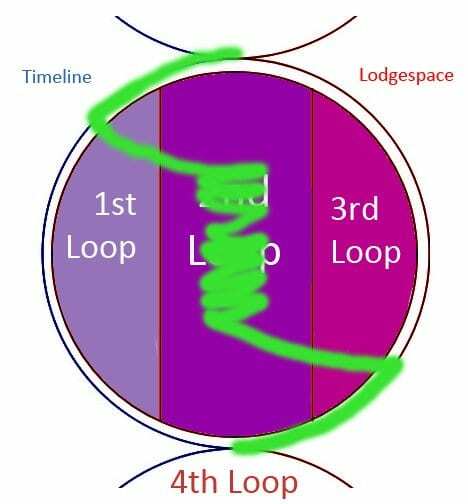 If you look (with the intention of negative energy) to Lodgespace, you’ve tuned to see events close to how they go in the 3rd Loop. Because the loops happen in order for Dale, we feel the time loops assert themselves in that order within Season 3. That’s why people like Jerry Horne feel they’ve “been here before” too. 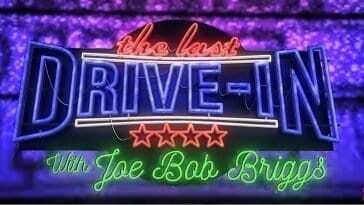 We see the original Timeline/1st Loop superseded by the 2nd Loop: instead of Hawk meeting Dale when he sees the red curtains in Part 2, Dale overwrites the perceived timeline by beginning the superhero arc that contains the Judy plan and Freddie vs. BOB. Hawk never once mentions the curtains scene because he’s tuned to the 2nd Loop now. 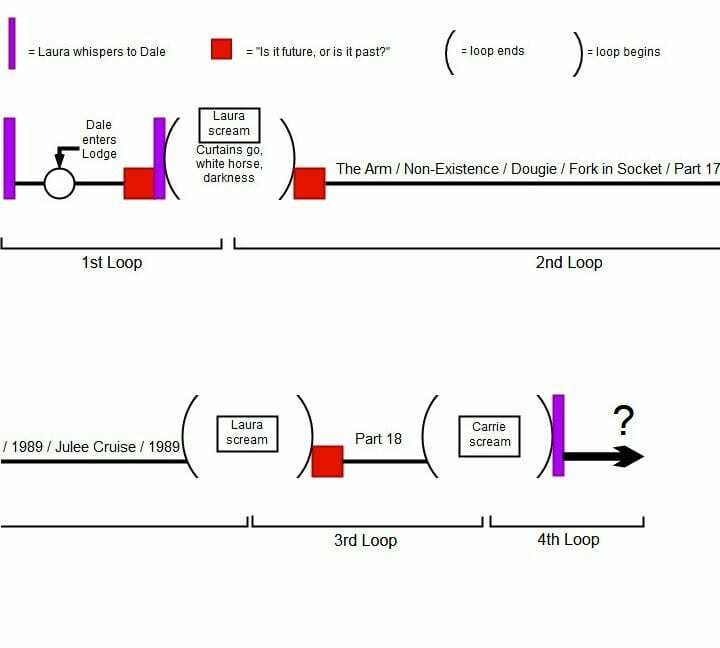 In Part 10, Margaret speaks to Hawk about the dream asserting itself too, which I say is visual confirmation of the 3rd Loop superseding the 2nd Loop. though that started in Part 7 with Andy not having a chance to meet the farmer at Sparkwood & 21 (hence the dramatic Laura Palmer Theme in the scene). Both loops flowed like a river over what came before, settling into its place as the dominant point of view that we see. Dominant because it is Cooper’s point of view. The path we are shown in Season 3 tunes and re-tunes generally to this line: The rest of the circle is still there. Even when you’re hip-deep in this in-between zone, the trauma Dale wanted to erase hasn’t gone anywhere. 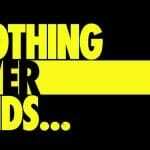 And neither has the Timeline (or Laura’s death). Dale’s just looking away from it after Part 17, at least until that 4th Loop. And that dangling 4th Loop at the end resonates with the missing diary pages Hawk and Frank read in Part 7. Three pages were found. Three Lodge Loops are shown in Season 3. Hawk and Margaret’s Log were “on the same page” right before the 1st Loop ended, Carrie Page is in the 3rd Loop, and there’s a missing 4th page we know about but cannot read just as there’s a 4th Loop we know about but will never experience as it only exists beyond Season 3.  Now that we’ve looked into Season 3’s shape, come back next time to see how the Timeline and Lodgespace influence and tether themselves to this in-between state. Thanks go out to Adam Stewart, T. Kyle King, Kylee Karre, Caemeron Crain, Brien Allen and Rob King for their tenacity in reading every part of this theory and providing me feedback during my writing process. Between loops two and three would be my guess. 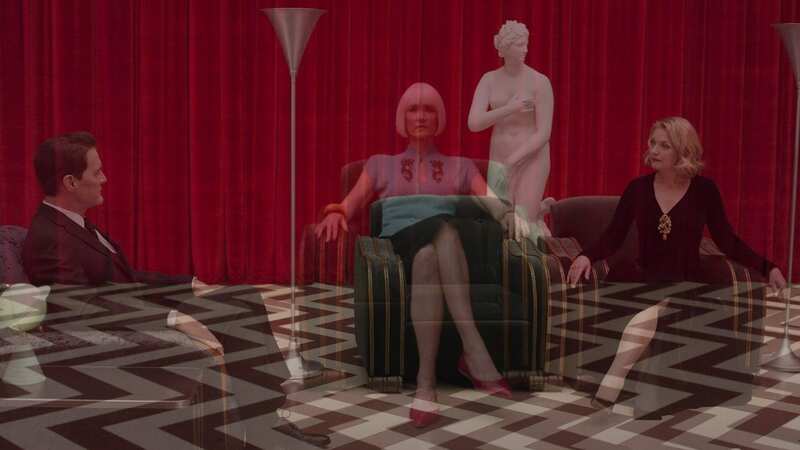 in the beginning of what you describe as the second loop, Cooper seems to pass into a doppel-Red Room that goes hazy and superimposes over the original, as he passes into blue electricity (which Lynch used in Mulholland Drive when “Diane” passed into a different state of awareness at the club). Is this doppel-Arm/doppel-Red Room part of your middle reality that kicks off “Loop 2”? I ask, because in your paradigm, I would assume the Red Room occupies Lodgespace on the right. If a deeper Lodgespace exists, as in a doppel-Red Room, this would seem to require an additional mirror that would necessitate a third dimension to your two-dimensional diagram. Or in your interpretation, is the Red Room a super position over all aspects and not Lodgespace? If the Red Room is a super position over all realities material and non-material, then I could see it having its own double where the perceptions from this space as it looks down on the realities is either positive or negative, and Dale chooses to go negative and thus enter a doppel-Red Room. Lynch and Frost both seem to use the Red Room as a junction point point, and in part one I’d established that junction points are squarely in tbe middle….I think the floor separations are kind of like how there were stuttering woodsmen and there were multiple deputies appearing by Jackrabbits Pallace. You can see the multiple frequencies (or the different loops) all at once when you’re nearby a junction point that can access the multiple frequencies. That’s the short of it anyway from my perspective.